What about Badges and Moodle? So what is a badge? or specifically what is an Open badge? According to openbadges.org the central site about open badges, “a digital badge is an online representation of a skill you’ve earned” But Open Badges take that idea further allowing you to verify the skills through a credible organisation. As someone explained it to me – “if a resumé or CV is a bunch of claims, Open Badges are a bunch of evidence”. So just like a qualification in the “real world” carries the reputation of the issuing body, an open badge carries the credibility of the organisation. 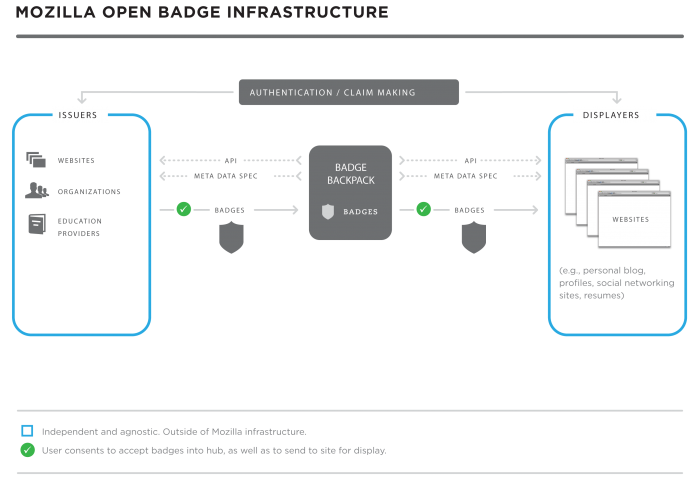 as open badges are not “proprietary” any organisation can create and issue badges and provide the verification of them. users can collect these open badges from many organisations and then package them together to provide a full picture of their skills. In general, normal certificates printed for a course that the person has been taken are not something that can be easily managed online. Yes, they can be scanned and uploaded but then anyone could edit that. Which brings the second aspect of certificates that they are not easily automatically verified. Some institutions have systems that can provide verification based on a unique code. There are also businesses that specialise in qualification verification.. So open badges solves multiple challenges at once by enabling both the collation and display, and the issuing and verification – thus assisting the issuing organisation, the learner (badge earner) and potential employers or people interested in those skills. So how are they earned? fixing or adding either a header or a paragraph to a Mozilla Webmaker Project by using the proper texts. fixing or adding a list to a Mozilla Webmaker project by properly using the ordered and unordered list tags. So what about issuing open badges? Those organisations wishing to issue badges need to put in place the infrastructure required to both award and provide verification for the badges. As mentioned it is free software and an open technical standard. This enables anyone who wants to and has the system or resources to put one in place to start awarding badges. The below image from the Mozilla.org wiki shows the infrastructure at a glance. So how does this relate to Moodle? Through the new version, Moodle can be that infrastructure to issue and verify the badges. It is possible to set up Badges at site level or at a course level. What is the difference? Finishing a course or a set of courses with a minimum grade or by a certain date. And of course it could be all of these, such as completing the course and being granted it manually. Lets take the course based Badge. Lastly they enable to badge. This process is shown in the below video. The a student can complete the criteria so that they are awarded the badge. This process is shown in the below video. A Teacher is then able to look at the badges in a course and the recipient list of who earned the badge and when. This process is shown in the below video. One last point – what is difference between a badge and a certificate in Moodle? This is a question that has been asked me nearly every time I bring up badges with organisations I work with, but usually structured as “Which should I use – a badge or certificate”? Certificate is a add-on activity in Moodle that will dynamically create a PDF for the learner to download and print as proof they have completed / achieved something. This is very much a digital delivery of an offline method of proof. So if a user wants to collect and present online the certificate they can, however there is no automated way to verify the authenticity of the certificate. Also, with a certificate the Name of the course and other data are visible on the certificate to provide context as it is usually printed out. The Open Badge system allows for this verification and for users “taking with them” their digital rewards. Although the image for the badge does not show the same details, there is meta data included in the PNG to enable the verification of what it represents. I certainly see that people will be issuing badges for discrete parts of courses and also issuing badges & certificates for the full course itself. But time will tell. This entry was posted in Moodle and tagged Badges, Moodle, Mozilla, Open Badges. Bookmark the permalink. Seriously though, this was the crux of my post at http://www.markdrechsler.com/?p=1016 and how Open Badges relate to a more standards-driven model like a Tin Can API compliant LRS. Unless I am wrong about Open Badges and their portability – which I could well be – I am definitely still trying to wrap my head around the different projects going on in this space. Good point. As it is an open design, they are totally portable in case Mozilla just vanished or dropped the support. Where will the Open Badges Infrastructure be hosted after it’s built? Will this hosting be “lifelong” to match the goal of students engaging in lifelong learning? Our goal is to support lifelong learning through ongoing access to badges. Mozilla is building the reference implementation to support a federation of badge backpacks that will be hosted by various organizations. We are building the infrastructure in a way to support complete decentralization and openness. This is intended to make it easy for organizations, or even individuals, to manage their own backpacks and still work within the wider ecosystem. So I guess that answers it as a yes. Cool – I’d not seen that! Definitely answers – to an extent. I guess I’ll believe it when I see that they have actually implemented that portability rather than just tagged it in the ‘gunna’ basket. One of the key design decisions was to make badges that could express without being language dependent and would work at various sizes. Often text in badge images gets lost at smaller sizes. Moodle says they display at 90×90. I’ve also explored some of the standard sizes used across badge sites in the hope the community can find some consistency, so far I’ve seen 150×150, 180×180, 250×250, 256×256(good for webgl). We found a lack of suitable badge graphics were available to learning development managers and educators. Most demonstrations of badges in learning management systems such as Moodle used random clipart or unlicensed materials. Our hope is, with a free set of engaging and communicative badges, the adoption of gamification features in learning management systems will flourish. 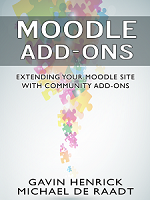 Feel free to include this resource in your article, it may get some Moodle admins using the badge feature in production sooner.